AVERNY is a veterans’ service organization of patriotic Lesbian, Gay, Bisexual, and Transgender American armed forces veterans and service members, who are proud to have served their country, and their lovers, partners, spouses, supporters, friends and family. AVERNY is the New York chapter of American Veterans for Equal Rights-OutVets. We provide LGBT veterans advocacy and information about VA medical benefits; march in NYC area LGBT Pride Parades and Veterans Day Parades; advocate LGBT rights legislation; and provide support and social events for LGBT vets and active duty service members. are invited to march with AVERNY. Send you name, phone number, country, and email address. We will send you line up and other details. We march proudly with the American and Rainbow flags. Uniformed allied vets noted above may carry their national flags. 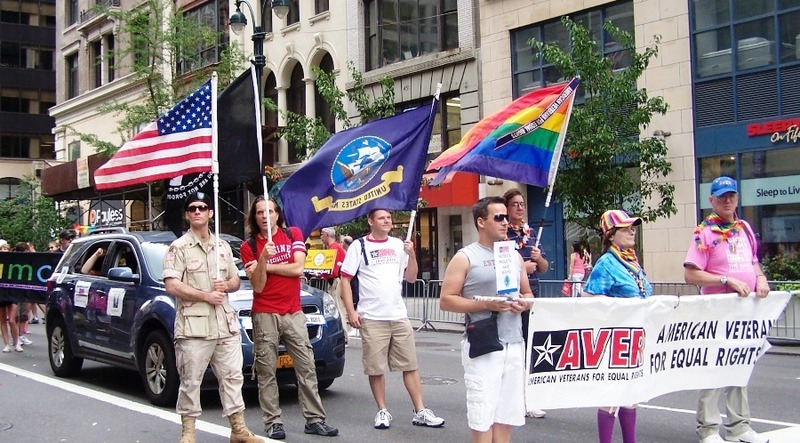 AVER-NY in the NYC Pride Parade June 26th 2011, "LGBT Patriots, Proud To Have Served"
Or you can just come to our meeting and ask for a membership form. present and former members of the U.S. Armed Forces. AVERNY is a 501(c)3 non-profit organization. CONTINUE OUR WORK FOR YOUR RIGHTS.